I’m sorry. If you’re working on your new year’s resolution of eating healthy, this recipe is not going to make that easy. I’m not sorry to be sharing one of our favorite recipes of all time however. 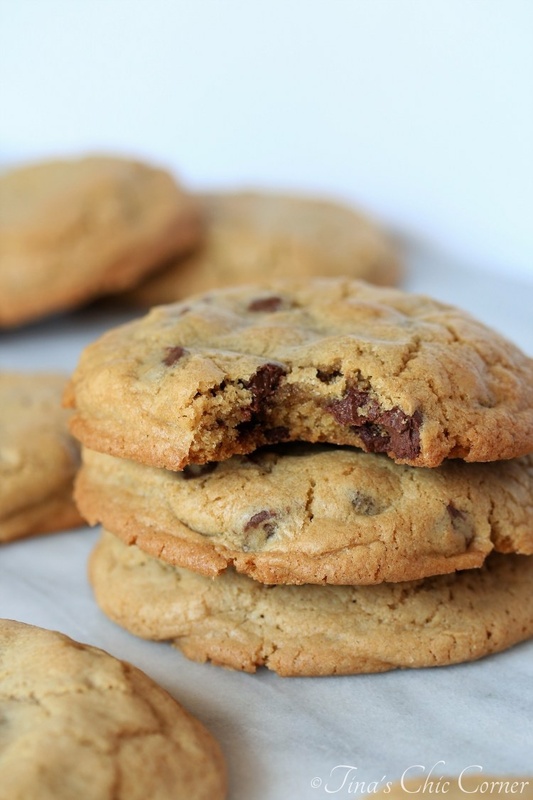 While I was busy baking all sorts of cookies during the holidays for friends and family, my husband wanted to whip up a batch of chocolate chip cookies, some to share with guests and some to indulge ourselves without feeling guilty for sneaking from the other piles of cookies that were really set aside to give away. My husband only makes chocolate chip cookies in one size, giant. 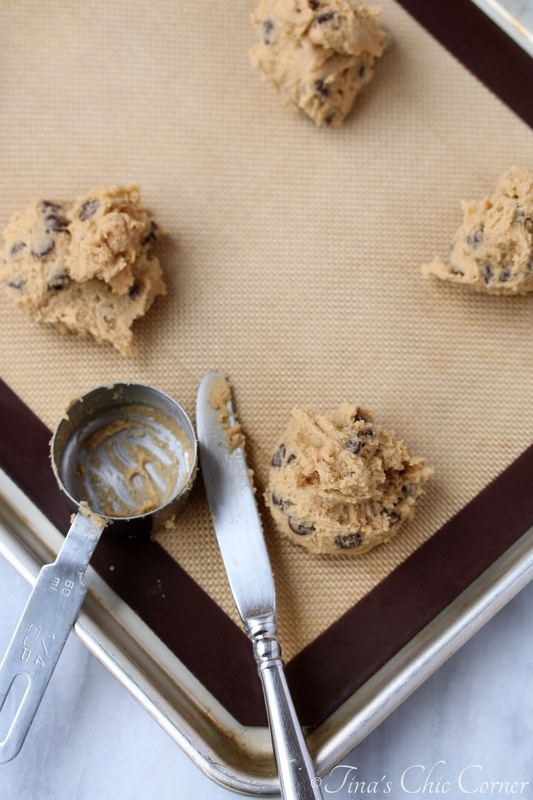 It’s 1/4 cup of cookie dough… per cookie! 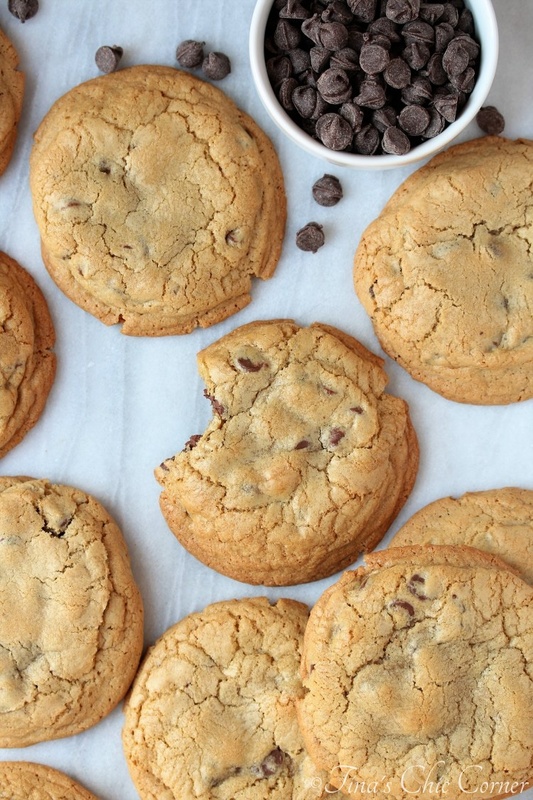 Sometimes a regular batch of regular-sized cookies just won’t do the job. 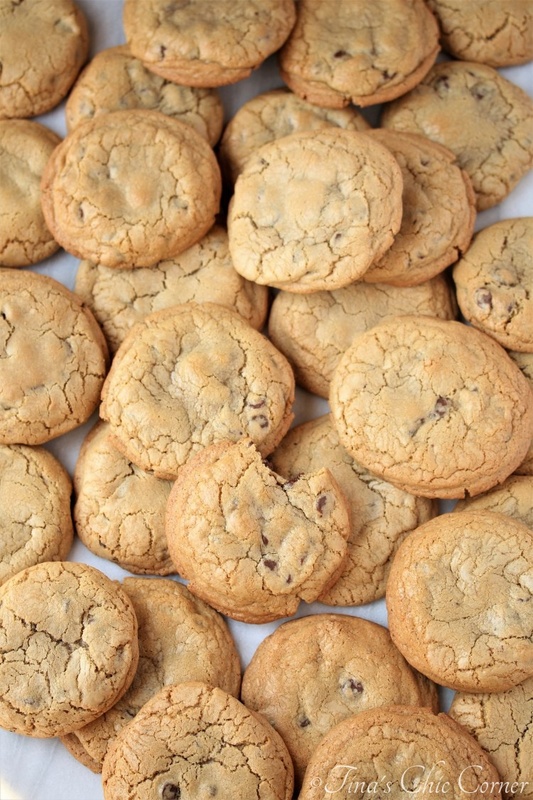 Maybe you have a big crowd to feed cookies to such as a cookie swap or a work function? Maybe you prefer cookies that are large and you want a pile of them all for yourself (like someone I know 😉 ). Whatever your reasons, this recipe will set you up. My husband has made this recipe twice now to make sure he had it right. He highly recommends that you use a stand mixer instead of a hand mixer for this one. (We use the big Kitchen Aid, but the regular size one should work just as well.) It’s a lot of ingredients and that means a lot of stress for your mixing device. The stand mixer approach was faster, easier, and showed no signs of stress. The hand mixer approach took longer, required a fair bit of elbow grease, and our Kitchen-Aid handheld mixer was working a bit too hard for a bit too long and was producing some rather unpleasant smells by the time we were done using it for this recipe on round 1. No permanent damage was caused, but it was enough to make me recommend a stand mixer or at least switching to hand mixing with a spoon near the end. Good luck if you go with the spoon approach, this dough is no joke thick by the end. And now a warning just so no one can say it wasn’t made clear… This one is probably pretty obvious, but it takes quite a while to make this many cookies, even when they large. Budget your time accordingly. 🙂 Since these cookies are ginormous, you need a lot of cookie dough to make sure that you have enough giant sized cookies to go around. My husband specifically asked me to get a photo with all of the cookies this recipe makes. While it does look like a lot of cookies (because it is), the photo below doesn’t do the cookie size justice because they look small. Look at this next picture and the normal bite that I took. Now can you get the sense of how big each cookie is? It’s literally bigger than the palm of my hand. Giant, I tell you. What are your plans for loads of cookies? I won’t judge you if they are all for you. 1 and 1/2 cups dark brown sugar, packed. In a large bowl, whisk together the flour, baking soda, and salt. Set the dry ingredients aside. In a the bowl of a stand mixer (or a very large bowl if you are doing the hand mixing approach), cream the butter, white sugar, and brown sugar. Mix in the eggs, two at a time. Stir in the semi-sweet chocolate chips. Line a baking sheet with a silicon mat or parchment paper. 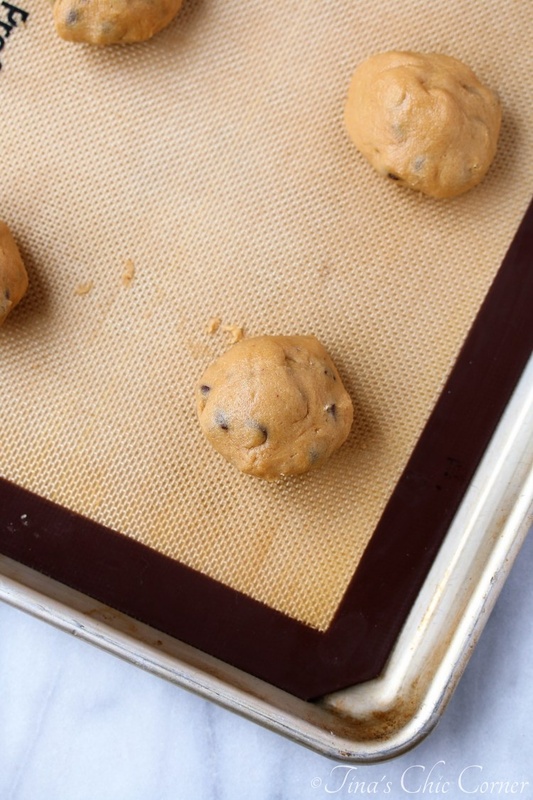 Using a 1/4 cup measuring cup, scoop the cookie dough onto the baking sheets. These cookies are large, so each cookie sheet should only hold 6 cookies. After measuring the dough for each cookie, pick the dough scoops up and roll each one in your hands to make it into a ball and put them back onto the pan. Bake them in the preheated oven for about 14 minutes or until slightly browned on the edges. I had very bad luck when I tried to bake two sheets at a time due to them ending up very unevenly cooked so I suggest just 1 pan worth at a time. Let them rest for about 5 minutes and then transfer them to a cooling rack.